Shichun Bao, M.D., Ph.D., associate professor of Medicine, unclips an insulin pump smaller than a deck of cards from her waistband to glance at its digital readout — but she doesn’t actually have diabetes and the pump contains only saline. Bao is personally test driving the latest in insulin-delivery devices so she can better teach individuals with diabetes about technology such as glucose monitors and pumps, how they work and even how it feels to wear the devices. She’s recently set up a new Diabetes Technology Clinic housed within Vanderbilt Eskind Diabetes Clinic to make sure patients with type 1 diabetes or an insulin-dependent form of diabetes receive this information routinely, especially as technology evolves quickly and devices are introduced to the marketplace. Bao pointed to the recently released insulin pump she held in her hand. When connected to a continuous glucose monitor worn by an individual, if their blood sugar reading is too high, it automatically pumps more insulin to them. If an individual’s blood sugar drops too low, it automatically stops insulin delivery until the level reaches a normal range. This is very close to being “an artificial pancreas” — a major goal of endocrine and diabetes research for the past decade, she said. Diabetes care has historically led the way in telemedicine, and as early as the 1990s devices such as fax machines and personal digital assistants (PDAs) were used by physicians and their patients to better monitor glucose levels. Today’s technology takes telemedicine a step farther with wearable devices and mobile applications to track glucose levels, and to share data directly with caregivers and health care providers. The new clinic will educate patients about this technology, and it will also educate health care providers who want to know how to use these devices to better care for their patients, Bao said. Brentwood resident Sherry Neergaard thought her previously diagnosed type 2 diabetes was not being well controlled when she first came to Bao for help in 2008. She was surprised to learn that she actually had adult-onset type 1 diabetes. As the single mother of a handicapped teenager, she worried that tracking her glucose closely would be incredibly challenging. Now, she uses a glucose pump and a monitor to manage her diabetes and receives education about how to best use the devices through Bao’s new clinic. Gary Vaughn, a 78-year-old retired minister in Cookeville, Tennessee, is another of Bao’s patients who wears an insulin pump, and he self-monitors his glucose levels. He was also diagnosed with type 1 diabetes as an adult, and remembers frightening incidents before he began using an insulin pump. Today, he enjoys working in his vegetable garden, exercising, leading a weekly Bible study for widows and not worrying about his diabetes. Patients seen at the Diabetes Technology Clinic learn about the most current insulin pumps, Continuous Glucose Monitoring (CGM) systems, and other emerging diabetes technologies. Clinic staff helps patients find the best device for their lifestyles. The clinic staff then trains patients on the use of their devices. Patients with new devices are supported through clinic visits and remote access monitoring. There are also opportunities for patients to participate in diabetes technology related clinical trials and clinical research, Bao said. 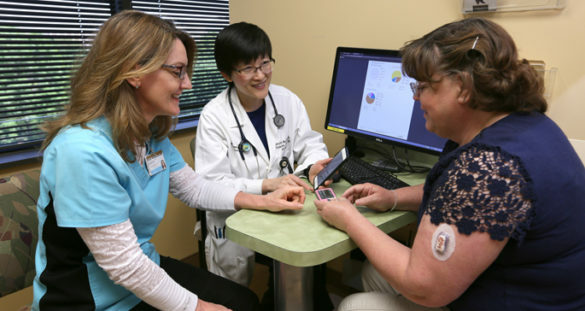 In addition to Bao, the Diabetes Technology Clinic is staffed by Lead Diabetes Educator Brenda Weedman, R.N., and other physicians, nurse practitioners and certified diabetes educators specializing in diabetes and its technologies. Individuals with an insulin-dependent form of diabetes can ask their Vanderbilt provider for a referral to the Diabetes Technology Clinic or can contact Vanderbilt Eskind Diabetes Clinic at 615-343-8332 for more information.